The death of Mary L. Abbott in Vancouver, Wash., August 19, at the age of 89, marked the passing of the last of a remarkable pioneer family. Mrs. Abbott’s father was Joel Coffey of Virginia, descendant of a family which traces its history from the arrival of Sir Walter Raleigh. A member of a branch of the Coffey family was an office on Andrew Jackson’s staff in the war of 1812. Sam Houston, who was a factor in bringing Texas into the union, was related to the Coffey’s. 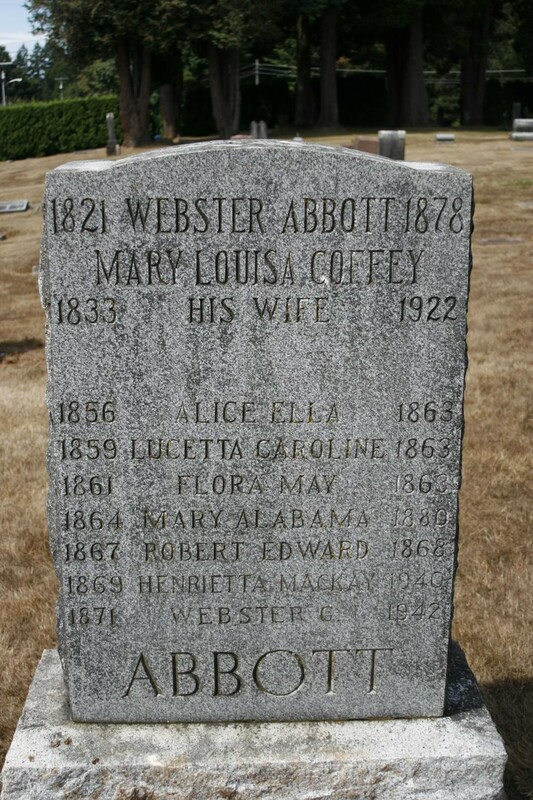 Mrs. Abbott was born near Booneville, MO., August 9, 1833. In 1853 she crossed the plains to San Francisco, where she met and married Webster Abbott a year later. In 1859 they settled on a homestead on Mill Plain, about eight miles from Vancouver, Wash. This farm has been in the possession of the family since that time and was Mrs. Abbott’s home up to the time of her death. Her husband, her brothers, Mac and Alexander Coffey, and her brother-in-law, Lewis Van Fleet, were vital forces in the early legislative assemblies of the territory, all serving one or more terms in the legislature. One of her sisters, Elizabeth Van Fleet, with the assistance of Dr. John McCarty, army chaplain, established the first Sunday school in Vancouver. Her other sister was Amanda Hosmer, a former pioneer resident of East Portland. 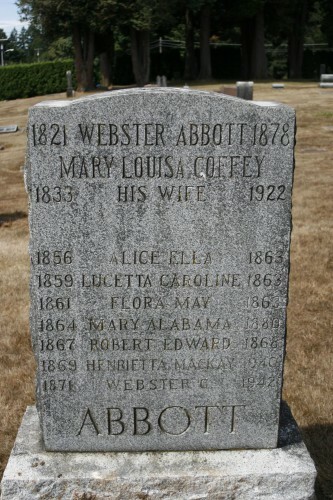 Two children, Henrietta M. Abbott of Portland and Webster Abbott of Mill Plain survive.